Main Features of CO3 - Online ERP és CRM. Egy fiók, rengeteg lehetőség.Online ERP és CRM. Egy fiók, rengeteg lehetőség. Store every conversation, email, call, meeting and deal you’ve ever had with a contact. With CO3 you’ll always know who you talked to, what was said, and when to follow-up next. CO3 allows you to take a birds eye view of all your projects and visualise your overall schedule. This is a great benefit for teams that manage multiple projects at a time – the project manager can quickly see which projects are on-track or behind schedule and act accordingly. CO3 lets you issue an invoice from anywhere in the world. You can keep your business going on while you are not sitting in your office. Cloud invoicing makes you forget the fear of PC crash or other cause of lost invoices. Invoicing module is in tight connection with Projects and Stock management. 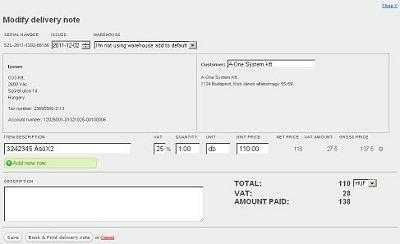 Just a few click and you write an invoice for a specified project or shipment. With the help of the finance module you can easily register your incoming invoices. You can export your contractors’ invoices from a project into the finance module where following the project managers’ fine tuning the finance department can trace all relevant items. just a few click. Making intake or delivery notes is simpler than you imagine. You can keep your eyes on stock while you are on the road or anywhere else. CO3 keeps track on your stock and notes, you will never forget to order items run out or issue invoices of shipped goods. The software is developed for teamwork. Team members may be assigned proportionally to each project and they will be notified about the current status and all modifications in the project. Create your company and then add people who are going to work on the projects with you. The system follows the organizational timeline and follows the same logical thread so it constantly keeps track of the organizational process with and instead of the event planner. The software puts organizational tasks in order, sets up priorities and alerts the project supervisor about upcoming and missed deadlines. Due to the web-based system all project related information is accessible anytime, anywhere. The file section within a project is where you can store all project related files so you can have easy access to them when ever you require them. Each subscription level has different amounts of file storage space available. The calendar plugin allows you to post up times for meetings and events, then gives you the ability to quickly invite and notify other project members. No software installation. It works on any computer; all you need is internet connection and a browser software. No need for IT staff. No software updates – the online software always works with the latest updates.